Six students from the University of Wyoming recently traveled to Idaho to compete in the Department of Energy’s CyberForce Competition, a cyber security competition hosted across several labs across the nation. The competition took place at Idaho National Laboratory (INL) in Idaho Falls, Idaho, on Dec. 1, 2018. 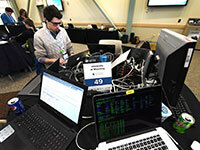 The regional CyberForce event hosted six schools as part of the nationwide competition. Along with UW, teams to participate at INL included Brigham Young University, Brigham Young University–Idaho, Idaho State University, LDS Business College and the University of Utah. The UW computer science students who took part are members of the Cybersecurity Education and Research (CEDAR) and Defense Against the Dark Arts (DATDA) groups on campus, which are dedicated to researching and practicing cybersecurity tactics. Assistant Professor and CEDAR Director Mike Borowczak served as the group’s adviser. The focus of the competition was to secure industrial control systems that control and monitor critical infrastructure. Using both hardware and cloud-based systems, competitors were tasked with securing a set of services provided to them to create a secure and usable work environment for a fictitious company. Unlike many of the lab's previous competitions, which were structured as a question-and-answer game, this competition was an “attack and defend” competition in which physical systems (four raspberry pis and a solenoid-controlled water pump) were actively being attacked by outside hackers. Student competitors were assigned as the “Blue Team” and were expected to keep systems operational for members of the “Green Team” who tested the services in the system, all while being attacked by “Red Team” hackers. The competition consisted of working with virtual machines in the cloud, but also gave students real-world feedback into their systems by providing teams with a physical control system. According to the students (who wished to remain anonymous due to the nature of the event and the potential threat of malicious hackers), it was an informative experience and they learned a great deal, including how to configure and secure new system components; integrate multiple components into one cohesive system; learn how many different system services need to be configured and how those configurations may still fail; how to behave in an active hostile environment in which programmers know hackers already are in the system and best practices for dealing with system elements that are inherently insecure. UW’s team performed admirably before finally falling to the Red Team, finishing 39th out of 70 teams nationwide. At the end of the competition, students were able to sit down with the members of the Red Team attacking the system to gain valuable insight into how the hackers were able to penetrate the system in order to better configure and secure them in the future. CEDAR and DATDA have several upcoming challenges and competitions, and invite any interested students to learn more.